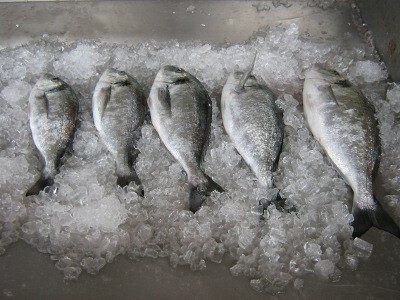 At Erissos Fish Farm we grow Sea Bream (Sparus Aurata) since the first day of our operations. Our growing methodologies, certified for compliance to the ISO 9001:2015 and ISO 22000 quality standards, are the product of twenty five years of research in simulating the natural way Sea Bream grows. This investment we have made in perfecting our methodologies is what has allowed us to offer Sea Bream of excellent taste and quality. Our Sea Bream comes in five categories starting at 350gr which is the average adult portion and continuing up to 1.500gr for sharing. The table below portrays the core categories of our Sea Bream product line and the corresponding ordering codes.